$239 Includes the use of our Powdered Frit Colors, Base Glass (90 COE), and all kiln firings for making samples. The only glass you will need to purchase is for making larger items, if you desire. Students must purchase a "Class Kit" which contains frit working tools. We will delve into the strange world of Powdered Frit... Frit Wafers, Liquid Stringer, FritSicles, "Organica", Cold Combing, Graphics, and much, much more as you discover what powders can do. Powdered frit is a very different animal from normal frit, so our focus will be on making lots of samples and working on technique rather than on finished projects. Students may make a finished piece, but will need to purchase glass and powders for any larger projects. 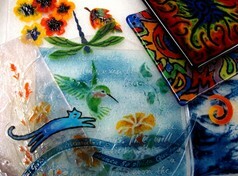 *Kiln firing fees are included only when using glass and frit purchased at Expressions. Additional firing fees will apply when using materials from outside sources.